Laugha Yoga is an ancient, new idea for reconnecting us with our true Self. Through yogic laughter sessions, Yoga nidra (guided deep relaxation), pranayama (yogic breathing practices) and meditation, we can reach a profound level of peace, joy and relaxation. 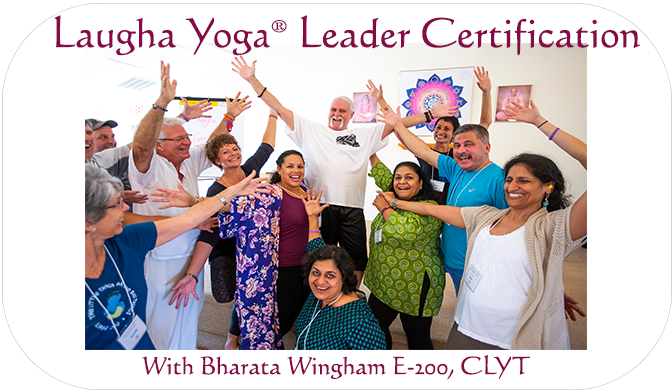 Receive certification to lead Laughter Yoga Sessions as a certified Laughter Yoga Leader (manual included). Download a zip file filled with talks, articles and an ABC News segment on the benefits of laughter yoga. Play “laughter games,” which release endorphins and T-cells to produce immediate and profound boosts to your mood, immunity, health, creativity and confidence levels. Discover why prolonged intentional laughter, a simple technique that has been overlooked for centuries, is being recognized again as a therapeutic method (first publicized in the West by Norman Cousins in his book Anatomy of An Illness). Learn how to use laughter as a form of social medicine spreading social health to the world. After completion you will be entitled to free access to the Prozone for 6 months at Dr. Madan Kataria's world-wide Laughter Yoga website. Participant receives 15 hours (approx.) credit as a Registered Yoga Teacher with the Yoga Alliance.